Imagine that you run a plumbing company in Scotland. Your local customers love you and want to work with you on a nationwide basis, but you don’t have the resources to take on contracts in Wales or down in London. 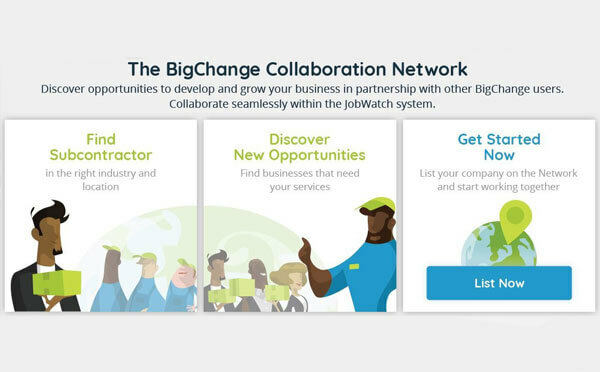 Through BigChange, you can now collaborate with other plumbing companies in other areas and sub-contract out the work. I can’t overstate the potential of something like this. Small businesses can act like big companies – at the touch of a screen. They can reach an almost unlimited scale, bolting on other services and growing their empires. Think of the savings in travel costs if you could sub-contract out work at the other end of the country? Virtual companies could be created, drawing on the expertise of other firms, using their sales and marketing expertise to grow and thrive. UK businesses could expand overseas using this system – something that many entrepreneurs may find useful post-Brexit. You could find a contractor in Australia for your customer and watch the job being done in real-time. In the past, collaboration like this has been bogged down in paperwork, email and endless phone calls. The mist falls over Paper Town and it’s hard to know what’s going on. With JobWatch, it’s all clear and paperless, and your partners appear like an extension of your own firm. Your customers even see the same screen if they log into the booking portal to check which jobs have been completed. Your partner company invoices you, and you invoice your customer as usual – all through BigChange.